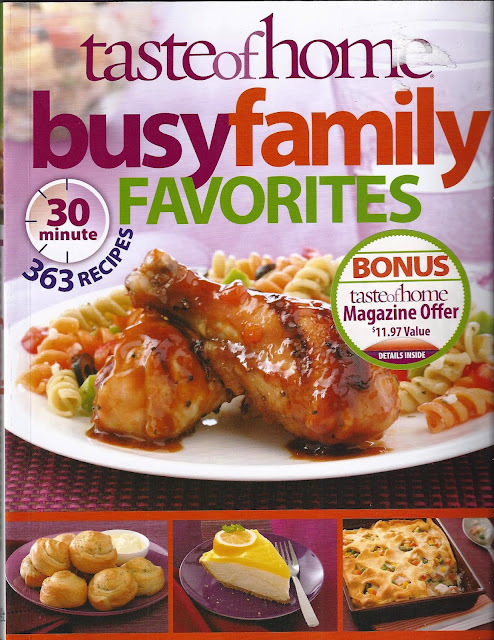 The Taste of Home Busy Family Favorites is a cookbook with 363 recipes that take 30 minutes to prepare. The recipes use kitchen staples readily available in grocery stores, with no hard-to-find specialty items. There are lots of choices, and most of the recipes are quick but also from “scratch”. The book contains 277 entrees, 86 sides and desserts and 231 photos. The book was printed in 2011, so the preparation instructions are right up-to-date. Many of the pages include tips to make the recipe faster or easier. I liked the variety and liberal use of vegetables and fruits. We found plenty of new ideas to try. Some of the recipes in this book are bound to become repeats on our menus. That lemon cheesecake at the bottom of the cover made me yearn for American food !